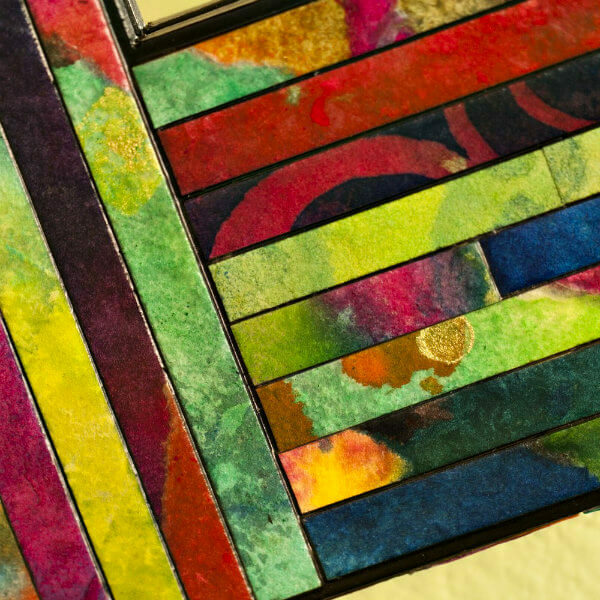 Meg Bollinger's richly colored, handmade papers transform frames, coat racks, mirrors, coasters, and magnets into appealing, functional art. Meg, the owner of Wisconsin-based Etsy shop Calyrew, finds a certain excitement in her work, as she's never sure what the end result will be. As a little girl, Meg was fascinated with paper - so much so that she wouldn't want to use the special pieces she acquired. (I bet lots of us can relate!) "But once I let go, I found a whole new world. Ahh, paper snowflakes, origami frogs, handmade cards to loved ones, and making awesome paper from my leftovers." I asked Meg about her process of turning discarded paper into such colorful and useful art pieces. The plain newsprint (no ink) that I use is packing material you might see instead of Styrofoam peanuts. The process is no real secret; actually it's even very hard for me to duplicate a sheet, which can be a bummer! I paint each sheet randomly once made and dried, using lightfast acrylic paints for fade resistance. There is no sizing applied so I can achieve a watercolor effect. As a last step, I brush on several layers of polyurethane for durability and water resistance. The name Calyrew by the way, is a combination of letters from each of Meg's children's names - what a nice idea! Amaze a child with a magic cardboard wallet. 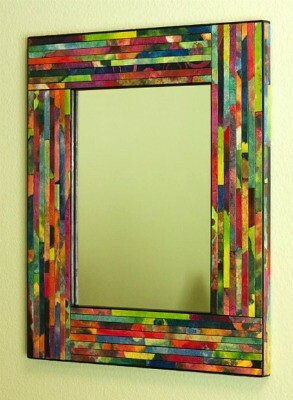 Lovely handmade paper wall mirror, the colours of her handmade paper are so brilliant. Great handmade papers. I like the creative uses to which she puts them. I love all your work is Beautiful! A woman after my own heart! Love this. Oh Ann it has been so long since I visited you. This is such a clever, creative idea. It is hard to get over the act of cutting the pages up isn't it? So pretty. Love those colors. And I can totally relate about saving pretty paper, even the tiniest scraps of them!